Between Valve And Valve Seat, Serviceable Heavy Duty Thermostat, Features Flow Control Characteristics, Fast Engine Warm-Up, Stable Temperature Control, Improved Fuel Economy For Driver Comfort, And Provides Longer Thermostat And Seal Life, Reduces Front Axle Weight, Cost. And Noise. COOLEST Thermostat on the market! 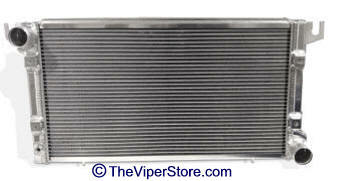 This American made performance radiator is a direct replacement for the thinner cored factory unit on you 03-10 Viper. It features two one inch thick furnace brazed racing cores (no epoxy) and a triple pass design for maximum cooling. 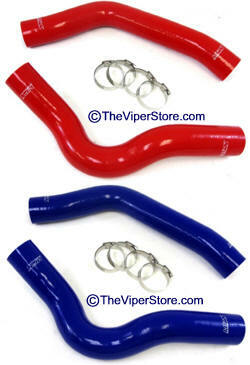 Made exclusively for the Dodge Viper by one of the leading Race Radiator Manufacturers! All radiators are pressure tested to ensure you'll have no problems after installation. New mounting hardware included. For maximum benefit, consider adding a cooler thermostat. 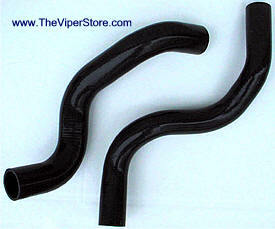 A single pass version is also available for track Vipers that have added a higher flowing coolant system. 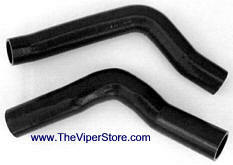 The triple pass may cause excessive pressure in the engine outlet hose in this application. Contact us for details. Dodge Viper radiator 3 ply hoses are made from a combination of high-grade silicone and heat-resistant embedded fibers for a high-quality replacement kit for your OEM rubber hoses. 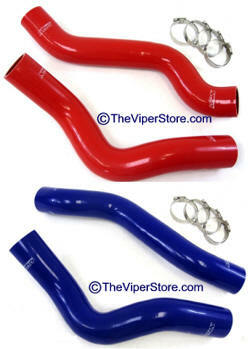 Available in black, blue or red, silicone hoses retain OEM fitment while providing increased pressure tolerance for the ultimate upgrade in performance and style. These High Temp Reinforced Silicone Radiator Hose Kit is designed to replace stock OEM rubber hoses which can eventually weaken over time, leading to premature failure. With premium quality silicone and race inspired design, this silicon radiator hose kit can withstand the harsh high temperature and high pressure operating conditions of the engine yet still maintaining peak efficiency during competition or daily driving. Choose your color Black, Blue or Red. 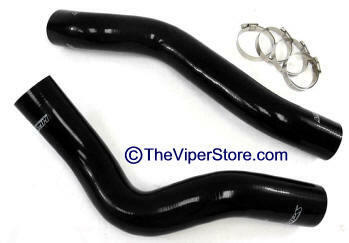 Heaviest duty all-silicone 4/5 ply hose for your Dodge Viper. Thick sidewall construction prevents collapse even at hi-temperature - no reinforcement spring needed with our hoses! Available by year, model and comes in black. Factory OEM replacement radiator fan module. Has a core charge. This is refunded to you when we receive the old stock fan back to us. 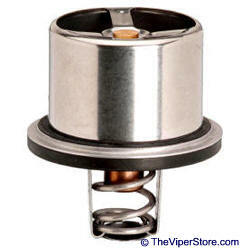 This cap features a sacrificial anode that stops Electrolytic Metal Erosion (EME) inside the cooling system of your Viper's engine. 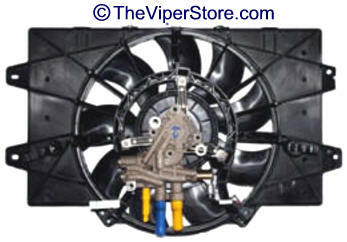 The cooling system of a Viper (and many other cars) carries a slight positive charge. This charge will cause erosion of the aluminum components in contact with the coolant. The sacrificial anode is immersed in the coolant tank and because it's a "softer" metal, the EME attacks it instead. Extends the life of all metal components in the coolant system. You'll be stunned to see the corrosion it begins to show after just two weeks. The anode will be eroding out instead of your engine. 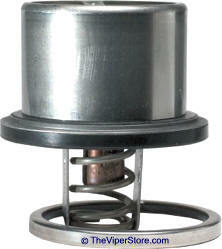 This item is for one Anode Radiator Cap. Extend the life of your expensive V10 Radiator! BEST thing you'll ever do for your Radiator! 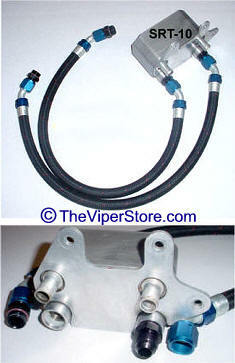 Due to customer requests we introduce the hi-performance oil cooler line kit. The OEM lines, that run between the engine and oil cooler, develop leaks (due to age) around the oil ring seals located on the engine and cooler fittings. These leaks are further amplified by cold weather (below 60° F) and excessive oil (crank case) pressure in supercharged Vipers. 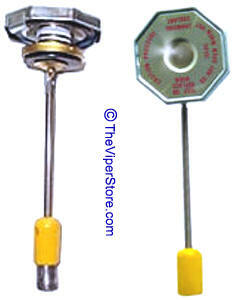 Our lines are made of the finest Kevlar Aeroquip #10 line with factory crimped Eaton Corp. swivel fittings. Aeroquip Kevlar lines are 60% lighter than braided stainless and rated at 955 psi between -94°F and 500°F (most braided stainless lines are rated to 300°F). 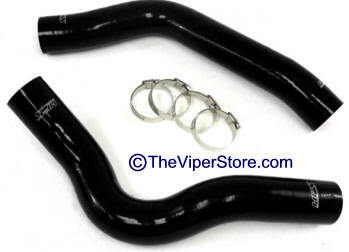 This kit includes 2 oil lines, 4 adapter fittings, and instructions. Oil Cooler is for reference only in these photos - not included.